We are using cutting-edge technology to create a shop that means fans can be “wearing” that the Islanders have said within hours of them saying it. Monterosa partners with ITV2 to launch first-ever ‘reactive’ mobile shop for Love Island. The shop lives inside the Love Island companion app and gives fans instant access to slogan T-shirts and personalised water bottles from the show, as it airs. ITV2’s Love Island is back and already making headlines. Its all-new companion app created by Monterosa features a world first real-time, in-app retail experience. Dubbed “Watch & Wear”, the pioneering Shop enables viewers to buy fashionable T-shirts and vests featuring slogans from the Islanders. Each ‘fast fashion’ slogan T-shirt will be sold in a ‘flash sale’ for a period of time starting from the moment the contestant says the words that appear on the T-shirt. Both women's and men's T-shirts and vests, in a variety of sizes will be available for £15 plus postage within the UK. The shop also stocks the iconic Love Island water bottles, which can be personalised with up to 11 characters for £15. Purchases will be made safely and securely and include frictionless payments with Apple Pay. The Love Island app is available to download now from the Apple App Store and Google Play. We are delighted to announce that ITV has signed a multi-year deal with us to create a range of apps for its key formats. It comes hot on the heels of the highly successful I'm a Celebrity…Get Me Out of Here! (2016) app, the all-new ITV Racing app and last month’s newly launched Britain’s Got Talent app. The deal will see Monterosa create new apps for the upcoming series of Love Island, starting Monday 5th June, and later in the year for The X Factor and I’m Celebrity. The apps will be powered by our award-winning LViS platform and innovative Fan Companion product. Fan Companion is an all-in-one native app experience that enables fans to interact with a show format throughout the week. It drives loyalty and provides a proven way to maximise the true value of fan data. 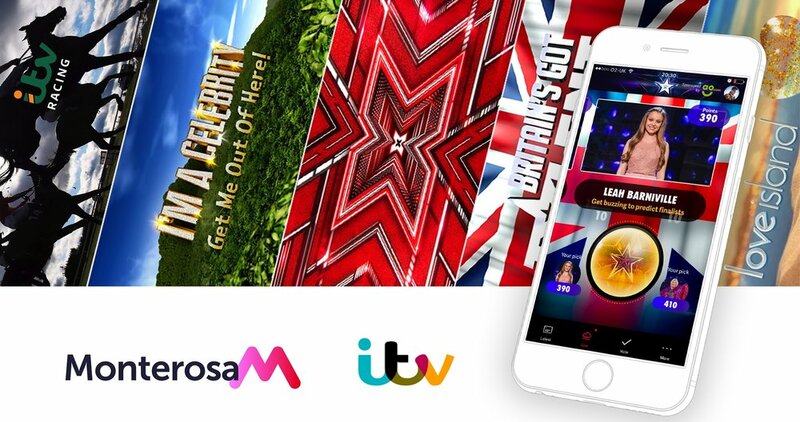 In the last 12 months Monterosa has powered over 515 million fan interactions and scored nine #1 apps in France, Portugal, Sweden, Chile and the UK - including I’m a Celebrity and Britain’s Got Talent for ITV. We'll be creating new apps for the upcoming series of Love Island, starting Monday 5th June, and later in the year for The X Factor and I’m Celebrity. The ITV Racing and Britain’s Got Talent apps are both available to download now from the App Store and Google Play, with others to follow later in the year.